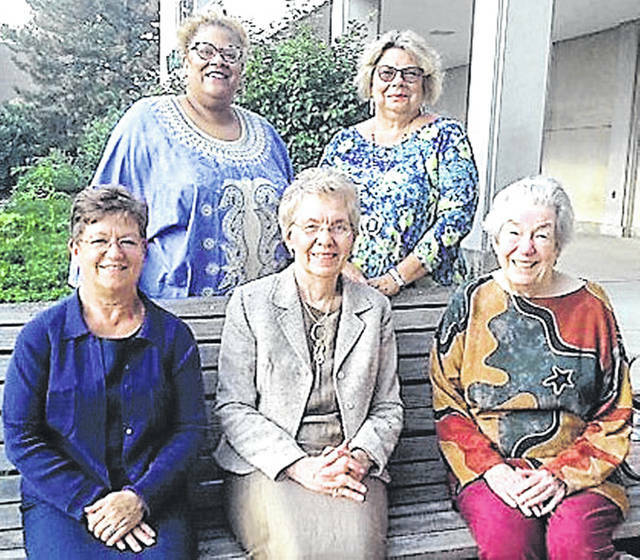 XENIA — Greene County Women’s Hall of Fame will induct Jane Baker, Gloria Dillon, Mary Smith, Paula Vaught and Debborah Wallace during the 38th Annual Recognition Day luncheon Saturday, Sept. 22 at Walnut Grove Country Club. The Greene County Women’s Recognition Day and Hall of Fame was organized in March 1981 to annually honor women of Greene County, living or deceased, who have contributed to the county’s betterment. Nominees must be either native-born Greene Countians or currently residing in the county with at least a 10-year residency. The Greene County Women’s Hall of Fame is an organization composed entirely of volunteers whose efforts are focused on bringing recognition to deserving women. It is endorsed by the Greene County Commissioners. Jane Baker of Yellow Springs will be inducted into the Hall of Fame for her endeavors in publishing, arts, and community service. She has made an impact on the county through her numerous contributions to a number of local non-profit organizations. As Production Editor of The Antioch Review, she has copy edited, done layout and facilitated its printing for more than 40 years. Jane is also the principal editor for Ripples, the annual literary publication at the Yellow Springs Senior Center. She was a founding member and first president of Chamber Music Yellow Springs which draws performers from across the globe to enhance the musical life in the county. The organization’s Competition for Emerging Artists, begun while she was president, serves to help launch the careers of young professional chamber music performers at a critical time in their professional life. Jane has served as trustee and volunteer for the Yellow Springs Community Foundation that serves a wide variety of needs in the community. A believer in the importance of affordable housing and as a long-time supporter of Yellow Springs Home, Inc., she put her beliefs into action when she privately donated a quarter-acre property to that organization which leveraged outside grants and loans to make new rental housing possible. Gloria Wade Dillon of Xenia will be inducted into the Hall of Fame for her dedication to education and community service. Gloria is an unsung hero who has significantly impacted the lives of children and their families in Greene County, especially in the Xenia area. A graduate of Central State University, she began teaching in the Xenia Community Schools in 1981 serving 30 years as a special education teacher and then counselor. She exemplified strong commitment and a caring spirit to help students build self-confidence to learn, respect others and become contributing members of society. Gloria acknowledged her calling and earned additional degrees and license to preach, founding Glory Ministries Church in Xenia in 2008 where she serves as pastor. She was the founder of Kiwanis affiliate “K Kidz” and served as its advisor. Possessing exceptional oratorical skills, Gloria is often sought out as a key speaker by many organizations across the state including the Ohio Education Association, Central State and others. In 2016 she was the recipient of the Charles A Glatt Human and Civil Rights Award given by the OEA. A life member of Alpha Kappa Alpha Sorority, Gloria has a passion and commitment to positively influence the lives of others and continues to contribute to her family, church, community and county. Mary Smith of Beavercreek will be inducted into the Hall of Fame for her efforts in education and volunteer activities. A graduate of the School of Consumer and Family Sciences at Purdue University, Mary began working part-time out of her home on a grant-funded position for the Greene County Career Center after moving to Beavercreek in 1972. She then became the Adult Education Coordinator at the Center, and during her 20-year career, she determined need for, planned and offered special interest adult education classes across Greene County. She established the non-profit GCCC Adult Educational Scholarship Endowment Fund in 1994, raising over $100,000. The scholarship continues to be award to full-time adult students. A great supporter of the Ohio State University Extension, Mary served for many years on the Family and Consumer Sciences Committee working in various venues which resulted in many joint programs offered by OSU Extension and the GCCC. She was a 4-H leader for 15 years, sharing her skills in clothing construction, food and worked with 4-H members on the state level. Mary was instrumental in organizing the private Bethlehem Lutheran School at her home church in Fairborn, which now includes grades K-8. She has spent her life using her talents and abilities to educate and encourage all the lives she touches. Paula Vaught of Xenia will be inducted into the Hall of Fame for her endeavors as an advocate for linguistic equality for the deaf. She is a nationally certified sign language interpreter who has and continues to campaign for social, cultural and linguistic equality. She is instrumental in providing early intervention services which provide support and resources for families with a young child with hearing loss. Paula has inspired future sign language interpreters, sharing her knowledge and experience as an instructor in the Sinclair Community College and Wright State sign language programs. She works hard to increase awareness of hearing loss in the community and developed a Facebook page for the Deaf Community Resource Center (DCRC) which provides information about upcoming events for all ages. She has organized signing classes for families of children with hearing loss and has organized fund raisers for the programs. She is currently Director of Programs at DCRC, serving nine counties in the area, providing supporting services to the deaf and hard of hearing population, their families and working with businesses and organization to make their services accessible to those with hearing loss. Debborah Wallace of Beavercreek will be inducted into the Hall of Fame for her endeavors in veteran services, local government and community affairs. She is a graduate of Bowling Green State University with Masters in Public Administration from University of Dayton. Debborah served in the US Army and assisted her fellow service members in the post-Vietnam era as a behavioral psychologist dealing with patient care, crisis and suicide prevention. As the chair of the Veteran’s Advisory Board of the Dayton VA, she advocated in Washington, Columbus and the region for veteran mental and physical health needs. In 2016, Debborah was the first woman inducted into the Ohio Veterans Hall of Fame in Columbus, OH. She is a member of the Disabled American Veterans, VFW Chapter 2800, and serves on the Board of the Miami Valley Military Affairs Committee. After moving to Beavercreek, she became involved in local government in 2001 when she was appointed to the Zoning Appeals Board, later to the Planning Commission. She was elected to city council in 2009 and reelected in 2013 serving two years as vice mayor. She was elected Beavercreek Township Trustee in 2017. Debborah is an active member of the Beavercreek Chamber of Commerce and the Beavercreek Women’s League where she is a past president. She has an obvious commitment to making our community a better place to live. The public is invited to attend the luncheon honoring these women 11:30 a.m. Saturday, Sept. 22 at Walnut Grove Country Club, 5050 Linden Ave. in Riversid. This year’s featured speaker will be Judy Baker. Reservations are $20 and must be paid in advance by mail with the final deadline of Sept. 14. Note on your check if you prefer the vegetarian option for lunch. Receipts will be held at the door. Checks payable to the Greene County Women’s Hall of Fame should be mailed to PO Box 703, Fairborn, OH 45324. For more information about reservations call Hall of Fame Chair Ann Byrd at 937-429-1805.